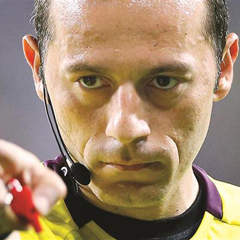 Lisbon - Portuguese newspapers on Tuesday said that the country's football federation is unhappy with the choice of Turkish referee Cuneyt Cakir for their Euro 2012 semi-final tie against Spain. "Portugal outraged: the appointment of Turkey's Cakir rings alarm bells," said sporting daily A Bola on its front page. The newspaper pointed out that the president of UEFA's refereeing committee, Angel Villar, was also the head of the Spanish football federation and his vice-president Senes Erzik is Turkish and a "friend of Barcelona and Unicef". A Bola claimed that as he still worked for Unicef he would have been involved in sponsorship negotiations between the UN child rights agency and Barcelona. The Record newspaper added that the Portuguese football association was "not happy about the appointment of the Turkish referee", adding that the Selecao "feared behind-the-scenes shenanigans and the major influence of Angel Villar". European champions Spain play Portugal on Wednesday in the Ukrainian city of Donetsk. Kick-off is at 20:45 SA time.